Although the Finest brand is one of the hobby's most celebrated, it has become somewhat lost in the shuffle in recent years. However, it looks as though a little tinkering with the format might bring it back to prominence. 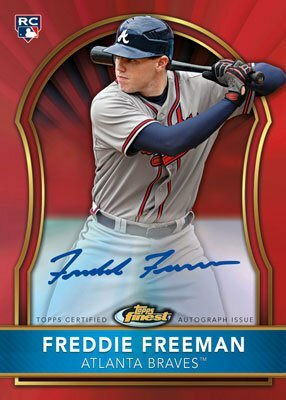 Besides the traditional Skittles mix of colorful refractors, the focus for the hobby-exclusive 2011 Topps Finest Baseball is on-card autographed rookie cards. The base set checklist boasts 19 rookie signers, all sticker-free. It also appears that the surprise redemption cards from year's past are gone. This renewed focus freshens the line up while sticking true to its roots. One serial-numbered rookie on-card autograph. One serial-numbered autograph rookie dual relic card. Two inserts (Finest Moments, Finest Freshmen, Finest Foundations). Base Set Refractor Parallels: Refractors, X-Fractor (/299), Green (/199), Orange (/99), Gold (/50), Red (/25), Die Cut Mosiac (/10), Purple (/5), Framed Printing Plates, Super-Fractor (/1), Canary Diamond (/1). On-Card Autographed Rookie Card Parallels: Refractors, X-Fractors (/299), Green (/199), Orange (/99), Gold (/59), Red (/25), Die-Cut Mosiac (/10), Purple (/5), Printing Plates, Super-Fractors (/1). Autographed Rookie Dual Relic Card Parallels: Refractors, Green (/149), Orange (/99), Gold (/59), Red (/25), Die-Cut Mosiac (/10), Purple (/5), Printing Plates, Super-Fractor (/1). Jumbo Patch Cards: 36 rookies are highlighted on multi-colored over-sized patches. Jumbo Patch Card Parallels: Orange (/10), Purple (/5), Super-Fractor (/1). Finest Moment Autograph Relic Cards: Eighteen veterans and their specific achievements are highlighted. Refractor, Orange (/20), Purple (/5) and Super-Fractor (/1) parallels bring more color to the chase. 60th Anniversary Autographs: Three more players are added to the cross-set signature series. Each card is limited to 60 copies and carries and birthday message for Topps. Finest-Themed Insert Cards: Inserted one per mini-box, these inserts fall under the following themes: Finest Freshmen (17 rookies), Finest Foundations (15 superstars) and Finest Moments (18 defining moments from current players). All have Orange and Purple Refractor parallels. 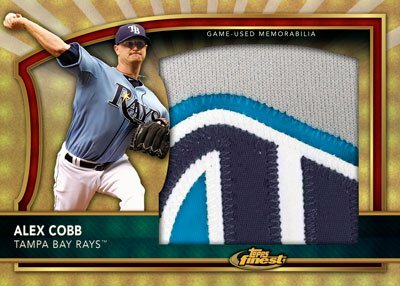 2011 TOPPS FINEST BASEBALL HOBBY BOX from SEALED MASTER CASE ! Mike Trout RC !?! David T � I agree. I’m always a sucker for Topps Finest but usually am more satisfied with the Football set then the Baseball one. But overall they are both worth getting each year.